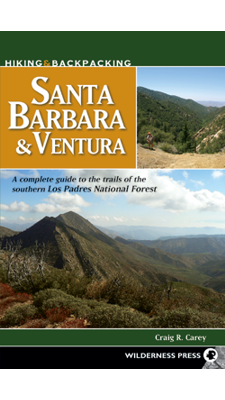 The revised first edition of Hiking and Backpacking Santa Barbara & Ventura is now available! Years of exhaustive research and exploring the forest yield a guide detailing nearly every trail in the southern districts of the Los Padres National Forest. Deep discounts on the guide are being offered at Wilderness Press, Amazon, and BN.com (the latter also offering Kindle and Nook editions, respectively). You can also find it at local brick-and-mortar retail locations (including area Barnes & Noble and REI stores, as well as local businesses Real Cheap Sports in Ventura and Mountain Air Sports in Santa Barbara … support local businesses whenever you can!). For those interested in a signed and/or personalized copy, I am offering those for US$20, including shipping (US; international buyers see me before ordering). Those new to the area or who also need the best area maps are encouraged to consider the Beard Bundle. To accompany the release of this first edition, I’m happy to also offer a downloadable pdf of the revision’s changes as well as additional errata/updates that may be of interest to anybody who uses the guide, which can be downloaded here.